Net sales for the quarter jumped 20.3 per cent YoY to Rs 21,400 crore. 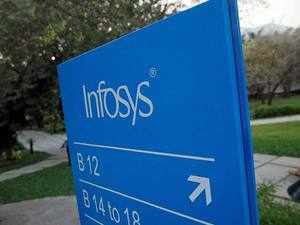 NEW DELHI: Infosys, India’s second largest IT firm, on Friday reported 29.62 per cent drop in consolidated net profit at Rs 3,610 crore for December quarter. The IT firm had posted Rs 5,129 crore profit in the corresponding quarter last year, the company said in a BSE filing. Net sales for the quarter jumped 20.3 per cent YoY to Rs 21,400 crore. On a sequential basis, sales grew 3.8 per cent in rupee terms. Sales were up 2.7 per cent QoQ in constant currency terms. The company announced a share buyback under open market route of Rs 8,260 crore at a maximum price of Rs 800 per share. It also announced a special dividend of Rs 4 per share. The company revised its FY19 revenue guidance in constant currency (CC) terms to 8.5-9 per cent. The guidance for operating margin (OPM) is retained at 22-24 per cent. “With increased client relevance, we saw double digit (10.1%) year-on-year growth in Q3 on a constant currency basis”, said Salil Parekh, CEO and MD. “We also had another strong quarter in our digital business with 33.1% growth and large deals at $1.57 billion which gives us confidence entering 2019”, he added. Consolidated attrition declined to 19.90 per cent in Q3FY19 over 22.20 per cent in the previous quarter. “Volume growth was strong and revenue productivity was stable despite Q3 being a seasonally weak quarter. We had good growth across geographies and large business segments”, said Pravin Rao, COO. “Attrition declined during the quarter and we are continuing on the path of increased interventions and employee engagements to reduce it further,” said Rao in a release.